For our favorite beers section, we have selected our own personal five favorite beers. Yes we know that you may have your own favorites and we do want to hear what they are; so please us with this information. We have plans to expand this section to include the opinions and favorites of the visitors to our web site, so hurry and send us this information, your name and favorite beer details will be published here soon. Remember, when telling us what your favorite beers are, you must tell us why its your favorite beer so that will can also be included on the page. Corona Extra and Corona Light are the two most popular brands of Corona Beer. Corona Extra, the flagship beer for Grupo Modelo, has been the number-one selling beer in Mexico for many years, and today reigns as the leading export from Mexico. It is the #1 Imported Beer in the United States. Corona Light offers the same smooth refreshing taste and is made with the same top-quality ingredients but with fewer calories and less alcohol content. Created with the purest water, the finest malt and the best hops, Corona Light satisfies! Corona Light is marketed only in the United States. Click HERE to go to the Corona Beer web site for more details about both brands. Americans love their Heinies. Heineken USA is a subsidiary of one of the world's largest brewers, Heineken. The company distributes brews such as Heineken, Amstel Light, Buckler (nonalcoholic), and Murphy's Irish Stout and Irish Amber, the only authentic Irish amber import in the US. Heineken USA's sales are growing, partly due to the increased market share of imports, even though Heineken lost its status as the #1 imported beer in the US to Grupo Modelo's Corona in 1998. 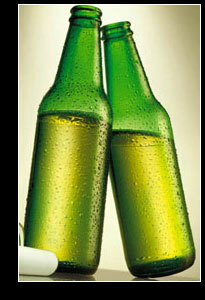 (It had been the leading imported US beer since its introduction in 1933 following Prohibition.) Heineken USA dropped its Amstel (regular) and Amstel 1870 brands in the US, but sales of Amstel Light are rising. Click HERE to go to the Heineken Beer web site for more details about Heineken Beer. Budweiser was introduced in 1876 when Adolphus Busch set out to create the United State's first truly national beer brand - a beer that would be universally popular and would transcend regional tastes. Today, Budweiser leads the U.S. premium beer category, outselling all other domestic premium beers combined. Budweiser is Anheuser-Busch's flagship brand and is distributed in more than 65 countries and reigns as the world's best selling beer brand. In the retail trade, the Budweiser brand sells to all customers. The average Budweiser customer spends more per shopping trip and is a loyal customer. Click HERE to go to the Budweiser Beer web site for more details about Budweiser Beer. Beer at Christmas time? Yes with some free Christmas Wallpapers to go if you can. Check it out! Making the highest quality beer has been a passion of the Miller Brewing Company since its founder, Frederick J. Miller, began his brewing business in 1855. Since then, Miller Brewing has grown from a small local brewer to the second largest brewery in the U.S., with seven major breweries located across America. Principal foreign markets for Miller Brewing Brands include Brazil, Canada, China, Guam, Germany, Great Britain, Ireland, Japan, Mexico, Northern Ireland, Puerto Rico, Switzerland and Taiwan. Click HERE to go to the Miller Beer web site for more details about Miller Beer. The classic Irish treat known around the world as Guinness Stout, is a dark thick stout not for the light-hearted. "Dublin makes five or six principal versions of Guinness, in a total of 19 variations, and exports around 40 percent of its output." (MJBC, p 181) There is a lot of lore around this 'different' beer. Many North Americans stay away for fear that it will taste like molasses. Here at beer sweet beer, we'll try anything. The interesting thing about Guinness is that it gets better with every pint. So give it a try. Guinness "...uses its original yeast, though this has been selected down from several strains to one, which was arrived at in about 1960. It works at high temperatures (around 25'C/77'F), and it is very dispersed, having neither risen to the top nor sunk to the bottom, when it is removed by centrifuge." (MJBC, pp 181) "No other brewery uses as much roasted barley as Guinness, which prepares its own." (MJBC, p 181). For further reading interest, check out the Guinness FAQ to go to the Guinness web site for more details.